How’s this for a sweet idea? Thanks to the introduction of promo codes for paid apps on Google Play, a new app, appropriately named Promo Codes, gives users one chance a day to receive a promo code good for redemption on a paid app in Google Play. Let’s explain a bit how this works. Each day, an app will be featured on Promo Codes. Inside of the app, a user can hit “I’m Feeling Lucky.” At that time, you will either win a promo code to download that featured app for free, or you won’t win. If you don’t win, you will be redirected to that app’s page on Google Play so you can check it out anyway. You can then buy it if you so choose. If you do win, the promo code is copied to your device’s clipboard, then on Google Play, you can redeem that code by pasting it into the redemption portion of the purchasing process. So, what apps can you win? As of right now, the list is relatively short, but as more developers choose to take part, the list will grow. Right now, there is the chance to win Nova Launcher Prime, Franco Kernel Updater, Focus, Cinnamon, Today Calendar Pro, Relay for Reddit Pro, and others. 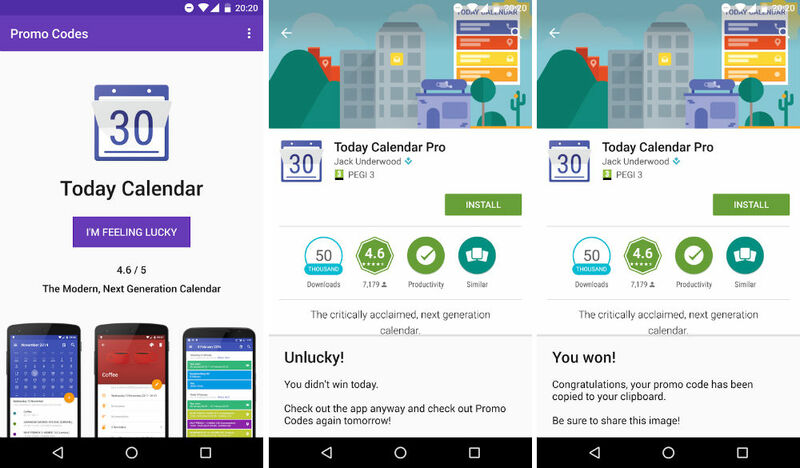 I went ahead and downloaded the app myself, just to see what the fuss was about, and wouldn’t you know, I won a promo code for Today Calendar Pro. If you want the chance to win a few free apps, this is a no-brainer. Grab it by following the Google Play link below. Question of the Day: What Do You Like About Your Android Wear Watch?